Curated resources to help you start building your audience, your influence and your writing career. There is no passion to be found playing small  in settling for a life that is less than the one you are capable of living. 1. Playing big. You are a writer. Obscurity is your nemesis, so find your voice and let the world hear what you have to say. 2. Providing you with the most extensive, practical and insanely useful content that can be garnered for each article. Then making it highly actionable by providing the steps for easy implementation. 3. Regarding your writing career as a business, and you as a professional. Published or unpublished, developing your public visibility and authority is largely (if not completely) up to you. Having the tools, hacks and skills to build your currency as an author is both powerful and necessary. 4. Creating momentum by developing a platform that works for you around the clock. While your platform spreads the word about who you are and what you’ve already accomplished, you can do what you do best: write. 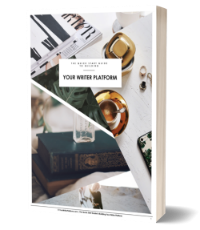 Your Writer Platform is where you can connect and learn from like-minded people that are focused on building their writing careers by increasing their reach and engaging their readers. All to often writers get bogged down in the technical issues of creating their platform. Ugh! It’s enough to drive any sane writer over the edge. I’m here for you, as a guide, as a peer and as a friend. I’ve been where you are and although it’s a tough hill to climb, the rewards for reaching the top  I think  are worth it.